Equipment for Education, Engineering and Vocational Training - Advanced Fiber Optic Analogue Transceiver Trainer - Fiber Optic Simplex Analogue Transceiver Trainer has been designed specifically for the study of a typical linear intensity modulation system for analogue signal transmission. Practical experience on this Trainer carries great educative value for Science & Engineering Students. Object: To determine the Numerical Aperature of optical fibre. Losses in Optical Fibres at 660nm and 850nm and other cables. Study of E/O Characteristic of Fibre Optic 660nm and 850nm. Study of O/E Characteristic of Fibre Optic photo transistor. Design and study of a linear Fibre Optic Intensity Modulation system for analog transmission : Gain characteristics of a Fibre Optic Linear Intensity Modulation System. Frequency Response of a Fibre Optic Linear Intensity Modulation System. Waveform distortion in a Fibre Optic Linear Intensity Modulation System. Gain-Band width product of a fibre optic linear intensity Modulation System. Features: The trainer consists of the following built-in parts: IC regulated D.C. power supply. Fibre-Optic Analogue Transmitter @ 660nm Fibre-Optic Analogue Transmitter @ 850nm Fibre-Optic Receiver. One-metre PMMA Fibre patch cord. Five-metre PMMA Fibre patch cord. In-line SMA adaptor. Two potentiometer to vary forward current of LED in Transmitter & current of photo transistor in receiver. SPDT switch for selecting wavelengths 660nm and 850nm. NA JIG with scale marked on it to measure length. Mandrel. NA measuring Scale to measure width of Fibre Optic’s LED. Adequate no of other electronic componets. Mains ON/OFF switch, Fuse and Jewel light. The unit is operative on 230V ±10% at 50Hz A.C. Mains. Adequate no. of patch cords stackable 4mm spring loaded plug length ½ metre. Good Quality, reliable terminal/sockets are provided at appropriate places on panel for connections / observation of waveforms. Strongly supported by detailed Operating Instructions, giving details of Object, Theory, Design procedures, Report Suggestions and Book References. Other Apparatus Required AF/RF Generator 10Hz to 1MHz Digital Fibre-Optic Power Meter Digital Multimeter Cathode Ray Oscilloscope 20MHz. We are leading manufacturers, suppliers & exporters of Advanced Fiber Optic Analogue Transceiver Trainer & Kit for Electrical Lab for Vocational Training and Didactic Labs. 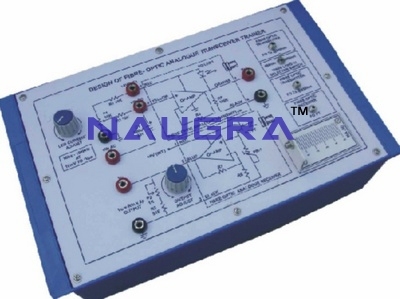 Contact us to get high quality designed Advanced Fiber Optic Analogue Transceiver Trainer & Kit for Electrical Lab for Vocational Training and Didactic Labs for schools, colleges, universities, research labs, laboratories and various industries. We accept bulk orders for government tenders in all countries around the globe. For similar products visit at main page of Fiber Optics Trainer.